Sophisticated simulation experiments at a MITRE lab help its sponsors develop improved warfighting capabilities to counter irregular threats. Irregular warfare—broadly defined as a conflict involving forces not employing traditional methods and not belonging to the regular forces of a legally constituted state—has emerged in the last decade as the dominant form of threat confronting the United States, both domestically and internationally. The Somali pirate incident last April is only the latest example of this growing national security issue. To proactively confront these threats with action (not reaction), a new U.S. military approach known as Operational Adaptation (OA) is currently under review. "OA is a concept that combines hardware, software, remote sensors, and networked communications that allow our military to develop a decision and action tempo that's beyond an antagonist's ability to maintain," explains Jim Dear from MITRE's Naval Program Directorate. In other words, the goal is to probe, shape, and manipulate the enemy at the tactical, operational, and strategic level. "Basically, OA aims to get inside the decision-making process of insurgents, predict what they're going to do, and counter it with a variety of command and control systems as well as sensors," he says. To help the military maintain the upper hand when faced by irregular warfare, the Office of Naval Research in Arlington, Va., recently conducted a series of sophisticated simulation experiments at the Naval Command, Control, Communications, Computers, Intelligence, Surveillance, and Reconnaissance Experimentation Lab (NCEL). The lab is unusual in that it's a Navy- and Marine Corps-sponsored lab located on MITRE premises. "That gives it a different flavor," says Dean Zywicki, technical director of the facility. "This lab is very synergistic," says Dear, the lab's project leader. Designed to host experiments involving realistic scenarios, uniformed operators, and simulated sensors and weapons, the lab enables sponsors to better develop integrated warfighting capabilities. MITRE has previously supported a variety of time critical targeting and maritime domain awareness experiments. The simulation experiments for Operational Adaptation, however, were prompted after a project officer from the Office of Naval Research visited the lab and observed a simulation experiment involving Navy sensors and C4I (Command, Control, Communications, Computers, and Intelligence) tools. To prepare for the initial experiment, which took place in May 2008, a data collection team from MITRE's Information and Computing Technologies Technical Center sat down with representatives from the Office of Naval Research to develop objectives for the simulation experiments. "It's very much sponsor-driven," says Zywicki. "All of the objectives at the SIMEXs [simulation experiments] are closely aligned with the sponsor, which exemplifies how we act as a trusted agent for the government." 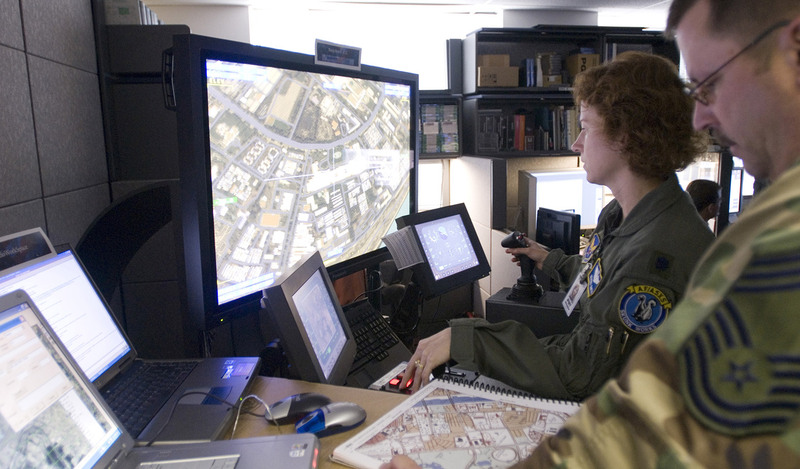 The Naval Command, Control, Communications, Computers, Intelligence, Surveillance, and Reconnaissance (C4ISR) Experimentation Lab (NCEL) is a Naval and Joint-sponsored lab that supports multiple Naval and Joint commands at the MITRE campus in McLean, Va. "We conduct several SIMEX [simulation experiments] a year to address sponsor tactics, techniques, and procedures, CONOPS [concepts of operations], and interoperability requirements," explains Jim Dear, project leader. "The lab focuses on C4ISR processes for time-sensitive targeting and surface surveillance and tracking, and we're able to address both ashore and afloat targeting environments." Much goes into the planning of a SIMEX, which kicks off with an initial planning conference that synchronizes and consolidates the mission of several sponsors. Thereafter, the CONOPS and technical architecture are developed and tested, a data collection and analysis plan is built, and the scenarios are finalized. A typical execution schedule lasts five days, resulting in an immediate, "quick look" report, which precedes the more comprehensive final report. Some of the complex SIMEXs that have come through the NCEL Lab recently include Joint Surface Warfare, Naval Special Warfare, and Maritime Domain Awareness. Unlike other large-scale simulation exercises, which are characterized by many experiences running concurrently for many sponsors, NCEL is distinguished by its singular focus. "Our niche is focused experiments, working side-by-side with the sponsor," says Zywicki. "We did a lot of system integration and testing before the SIMEX came together, bringing various aspects together in OA scenarios, ensuring things would work before the warfighters arrived and the experiments began," says Dear. To develop simulations to test new sensors—"some of which didn't even exist yet," according to Dear—required substantial collaboration, including seven different cross-discipline engineers from MITRE and three different government labs. "The fact that MITRE has a lab staffed with people experienced in running experiments, integrating simulations, and realistically representing warfighting scenarios in a controlled environment is a distinct advantage," says Dear. Zywicki described the team's role as "technical drivers" at the experiments. "Our contribution came in the form of software and middleware development, as well as providing operational research experts and data collection people who helped the sponsor understand the capabilities of sensors, and how best to employ them," he says. A few months after the initial SIMEX, another OA SIMEX at the lab took place in September. "Basically, we took their PowerPoint diagrams and made them real," says Zywicki. "We have teams that worked side-by-side with the customer throughout the entire process," which facilitated the development of new sensor capabilities for irregular warfare. "In some cases, operators used them in different ways than what they were designed for, and they learned new capabilities." The experiments also allowed the sponsor to provide training for participants who didn't have experience working with advanced technology in a Maritime Operations Center. "There's always a training aspect on top of the overall mission," says Dear. The two simulation experiments provided a valuable environment for Operational Adaptation to test its concept of operations as well as tactics, techniques, and procedures. The events also confirmed the lab as a productive training environment that could produce rapid results. "Within two weeks of the SIMEXs, we generated 'quick look' briefs, and within two months, we produced the final report that directly addressed the original objectives of the experiment," says Zywicki. This summer the Operational Adaptation sponsor planned live demonstrations in a field environment, which will follow up on the work performed at NCEL. "The sponsor was satisfied with the SIMEX results," Dear says.